The 33 Chilean miners trapped deep underground have been told they may not be rescued for several months, the country's health minister has said. Jaime Manalich said the miners, trapped 700m below ground since 5 August, had reacted calmly, AFP news agency said. Officials had delayed breaking the news out of concern for their mental well-being. A special exercise and recreation programme is being set up to keep the men fit during their long wait. They will also need to be in shape to be pulled up the 66cm (26 inches) wide shaft that is being bored to rescue them. That may take up to four months to complete. "We were able to tell them... they would not be rescued before the Fiestas Patrias [Chile's Independence Day on 18 September], and that we hoped to get them out before Christmas," AFP quoted Mr Manalich as saying. Although they took the news calmly, he said, "a period of depression, anguish and severe malaise" was possible. The miners had earlier urged every effort be made to free them by Independence Day. The leader of the crew of trapped miners pleaded with Chile's President Sebastian Pinera to get them "out of this hell". The president assured them they had not been abandoned. He told reporters the men would be out by Christmas. The miners were trapped when the main access tunnel collapsed at the San Jose mine in Copiapo, about 725km (450 miles) north of the capital, Santiago. They are located 7km (4.5 miles) into the winding copper and gold mine, where they are sheltering in a 50 sq m side-chamber off one of the main passages. Days of growing despair turned to jubilation on Sunday when rescuers made contact with the miners via a probe lowered into the mine. The health minister said the surface team wanted the trapped miners to set up routines, entertain themselves and attempt to simulate day and night. "The space they're in actually has about two kilometres [1.24 miles] of galleries to walk around in," said Dr Jaime Manalich. "We're hoping to define a secure area where they can establish various places - one for resting and sleeping, one for diversion, one for food, another for work." The US space agency Nasa has been called upon for its expertise keeping astronauts alive and well on long missions in confined spaces. The miners, who spent 17 days surviving on emergency supplies designed for a couple of days, have been receiving glucose and rehydration tablets lowered down a narrow shaft. 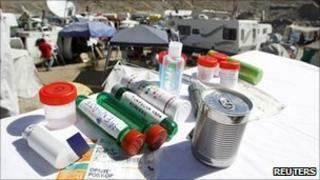 Other supplies included small lights, eye patches and medicine. Anti-depressants would be included with the supplies, the health minister said. An intercom cable has been dropped to them for communications.